Join us as we help celebrate the release of a 40th anniversary edition of David Bowie's truly groundbreaking and hugely influential album, The Rise and Fall of Ziggy Stardust and The Spiders From Mars. 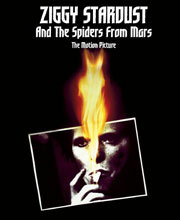 Originally released in June of 1972, Ziggy Stardust was David Bowie's fifth album, co-produced by Bowie and Ken Scott. Incredibly, the album was written whilst Bowie was recording 1971's Hunky Dory album, with recording beginning a couple of months before that album's release. Join us for a special screening of the D.A. Pennebaker documentary/concert film, which features David Bowie and his backing group The Spiders from Mars performing at the Hammersmith Odeon, July 3, 1973. After the film, Ken Scott will take the stage for a discussion, moderated by Vice President of the GRAMMY Foundation and MusiCares Scott Goldman.